I walked into the theater last night excited for a sneak peak of Avengers: Age of Ultron - the first movie I would ever see in a D-Box seat. I left an exhausted, delirious, smiling, happy mess. From the first drop of Thor's Hammer up until the final battle, the movie delivered 142 minutes of pure, orchestrated chaos and the seats were in perfect sync. Without spoiling the plot I can tell you that this installment in the Avengers series has Joss Whedon written all over it. There's a lot going on. Multiple story lines, several tie-ins from other Marvel entities (i.e. SH.I.E.L.D. ), new characters and cameos. You leave feeling like you've just watched an epic mash-up of what could have been two movies - dragged out over two summers - in one night. The basic plot, as seen in the trailers, is seemingly simple: Tony Stark, hell-bent on creating a peacekeeping program, gets exactly what he wished for in the form of Ultron, a "suit of armor for the world". But instead of protecting the Earth from what the Avengers can't, Ultron's intellect leads him to believe he needs to save the Earth from the Avengers. Because, let's face it, it's humans that are killing humans & destroying their very own planet, not robots. Although he is a genocidal maniac, Ultron kind of has a point. Voiced by James Spader and (to me) looking a whole lot like Jack Palance, Ultron is an interesting character and his presence raises interesting questions about our society, war and violence. That's where this movie takes a great turn and starts digging into our heroes' psyche. More introspective than any of the other Marvel films, this one provides snippets of personality profiles in the form of flashbacks and dialogue that makes us realize the Avengers are human and flawed. We learn their fears, their inability to understand each other and we wonder if they will be able to work together. The battle scenes are well choreographed mini masterpieces within the film. The D-Box seats during battles shook, banked, dipped, ducked and pounded at all the right times. I felt like I was right in the middle of the action, at the same speed. It was pretty unreal, and officially my new favorite "roller coaster". I loved that this movie had the courage to explore themes beyond just good vs evil. The battles that take place are just as much internal as they are external. It's about the conflicts these characters face in a complicated, modern world where the choices they make and the actions they take can save or destroy lives. 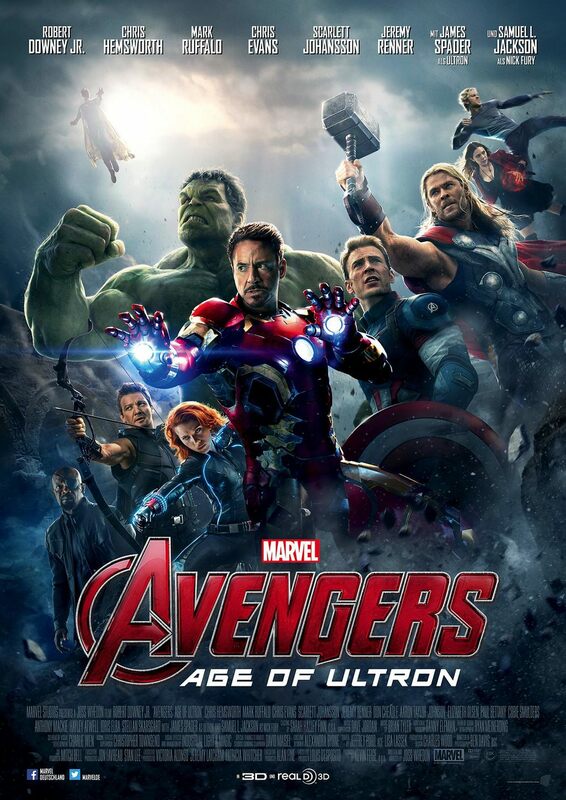 Don't miss Avengers: Age of Ultron. It's a beautiful mess, and it works. My only complaint: no Star Wars trailer. I wore my Empire Strikes Back tee expecting to see my man Han Solo. Wrong. I got dinosaurs instead. The D-Box seats enhanced every second of the film and the experience was one I absolutely want to repeat again. Hulkbuster style. Side note: Yes, stay a few seconds for the credits. Not until the FINAL credits, just stay a little bit.